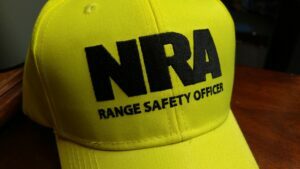 The RSO (Range Safety Officer) is the person at the gun range whose responsibility it is to ensure safety on the range. The RSO may not always stand behind each shooter and bark at you if you break any of the rules but generally the RSO is going to call out people who are crossing a line and making others feel uncomfortable. Some time ago I wrote an article about why we often don't recommend training at a public gun range due to the concerns for one's safety. Today I want to suggest that if you do train at a public gun range you should make the RSO your new best friend. You are only as safe as the least safe person in the room holding a gun and the range safety officer can help keep an eye on all the shooters. If you see something the RSO may have missed you can approach them and say something like, “hey can you keep an eye on the person in lane 6, I just saw them sweep their firearm across everyone in the range.” The RSO should be grateful for the tip and you have done nothing wrong to point something out. Of course the RSO is more likely to take your tip seriously if you already introduced yourself and are on a first name basis. At a gun range full of shooters there are likely a few or more people there that know a lot more about guns and shooting them than I do but it may be difficult to ascertain who those folks are. However, almost always I can count on the RSO to be one of those individuals. Wisdom goes a long way and there is a limited amount of it so I try to get to know as many people as I can that can teach me something. One of the greatest values of knowing the RSO is that they will also get to know you. They will know what you do for a living, what guns you like to shoot, and how you like to train. I know of one range where I can go and the RSO will allow me to employ some training techniques that would normally be against the rules but due to our long relationship at the range he allows it.